This diplomacy program is funded by the Bureau of Educational and Cultural Affairs at the U.S. Department of State. This program includes strategies employed by American professionals to counter corruption and bureaucratic entanglements in public administration. It will provide up to 75 participants in five groups of 15 each over the period of two years the opportunity to study public administration techniques and processes through two to four week internships with public administration organizations. The program aims to establish structured interaction among American and Pakistani participants and to develop enduring professional ties. In the first week of each program, the Pakistani participants attend a week-long orientation to U.S. public administration. This takes place in Amherst, MA and includes lectures from practitioners and academics, and site visits to local organizations and government offices. The first of the five programs took place in the spring of 2011. Candidates for the Public Administration professionals must express commitment to carrying out project activities; an understanding of project goals and objectives; less than fifteen years of service in the relevant field; current employment in the field of public administration and openness to change. Also preferred are candidates who have not traveled to the United States and who have not previously participated in this type of program. Applications from those working at the local or provincial level are preferred. The candidates should currently hold a position as a non-elected public administration professional at the local (preferred), provincial or federal level. Having earned a Bachelor's degree, the candidates should have at least five years of active experience in the field of public administration. They must demonstrate an interest and ability to transfer new knowledge and skills acquired in the U.S. to professional at home through projects developed in the U.S. All expenses for Pakistani participants are covered by the grant, including travel, accommodations, meals, and materials. This program will provide up to 75 participants the opportunity to study public administration techniques and processes through two to four week internships with Public Administration professionals in the U.S. over the period of two years in five groups of fifteen. The program is tentatively advertised in Jan-Feb. Demonstrate an interest and ability to transfer new knowledge and skills acquired in the U.S. to professional activities at home through projects developed in the U.S. Applicants with a dual U.S./Pakistani nationality or those who have a parent, spouse, fiancÃ© or child over 18 years of age who is a U.S. citizen or permanent resident are ineligible. Employees of the Fulbright organization or the U.S. Department of State and the Fulbright and Humphrey alumni are also ineligible. People who have applied for immigration to any country are also ineligible. Complete application package, including academic transcripts and two letters of references must be submitted to USEFP at P.O. Box No. 1128. Applications will be uploaded on the website as soon as the program is announced. I received an application form/printed out an application form from the website http://www.usefpakistan.org. Now what do I do? Before beginning to fill out the application form, it is imperative that you read the application in its entirety as well as the general information pages and instructions that accompany it. The general information pages give an overview of the program and application review process. The instructions provide specific information about completing certain points of the application. Be sure to fully complete the application form. If a section does not apply to you, please write "Not Applicable". Do I need to take any standardized Test like TOEFL and GRE? No but applicants must possess good communication skills. I have earned a Master's degree; am I eligible to apply for this program? 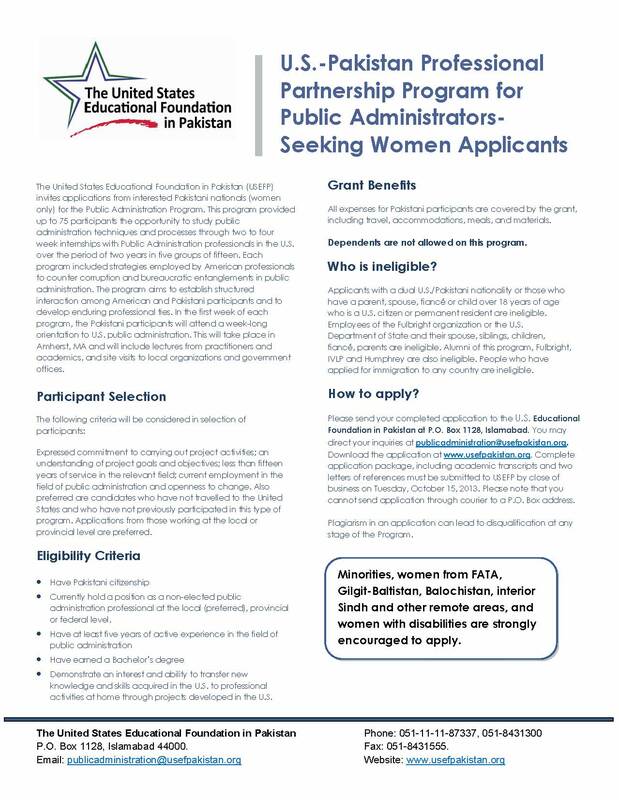 I am working in the field of Public Administration but not a government employee; can I apply for this program? No, this program has been designed especially for those who are civil servants and working directly under the Government of Pakistan. I am a civil servant and have experience of 20 years in the field of Public Administration; can I apply? This program has been designed for those who have experience of less than fifteen years in the field of Public Administration. Therefore, you are ineligible to apply if you have experience of more than fifteen years. I have already been on Fulbright scholarship previously; can I apply? Fulbright and Humphrey alumni and alumni of any other US Embassy funded program are ineligible to apply for this program. In fact, the preferred candidates are the ones who have not travelled to the United States and who have not previously participated in this type of program. Reference must be written by a professional mentor, professor, or other associate outside your current work setting. Personal friends or family members are NOT acceptable references. It is preferred that the reference letters are sent directly by your referees in sealed envelopes. It is important that your referees should clearly mention the name of the program the applicant is applying for and the applicant's name on the envelope. Should I send my original documents with my application form? Please send attested photocopies of all your documents (transcripts, degrees, certificates, etc.). Do not send us any original document. Round 1: All applications are screened by USEFP staff for completeness and minimum qualifications. Round 2: Complete applications that meet the minimum qualifications are evaluated according to a set of established criteria and shortlisted. Round 3: In-person interviews of short-listed applicants take place in Islamabad. The interview panels are made up of both U.S. and Pakistani citizens. Round 4: Applicants who become finalists or alternates are notified by e-mail and official acceptance letter. Those who do not get selected are notified only by mail. Do I have to return to Pakistan as soon as I've completed my program? Yes, under the provisions of a J-1 visa, you are required to spend two years in Pakistan on completion of your program before you can return to the U.S. on anything other than a tourist visa. Under the terms of your grant, you are required to return immediately after completion of your program to begin your service requirement.